Putting an end to speculation around the post that being offered to former Kerala Chief Minister V.S. Achuthanandan, Communist Party of India-Marxist politburo member Prakash Karat on Monday said that this will be decided by the state cabinet.Addressing reporters here after a two-day state committee meeting of the party, he said that the decision was made that given Achuthanandan's age and health, the chief minister's post was not going to him. "Running the election campaign is one and running a government is different. What I could have done years back, I find it difficult to do it now. 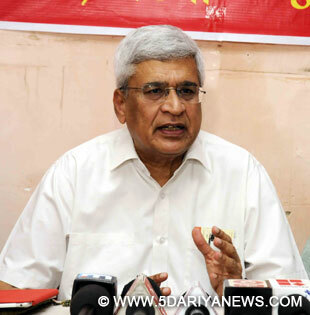 "Our party has taken the appropriate decision on the post of Achuthanandan and now it's the Kerala cabinet that will now decide," said Karat.During the month long election campaign in Kerala leading to the April 16 assembly polls, Achuthanandan was the star campaigner for the CPI-M led Left Democratic Front, but after they registered a resounding victory, the 92-year-old was left high and dry and his arch rival Pinarayi Vijayan was given the chief minister's post, much to the dismay of the veteran and his supporters.What came as a huge shock to the veteran was general secretary Sitaram Yechury gave him a decorative title as Kerala's "Fidel Castro".Achuthanandan is all set to get a fresh post which will have the status of a cabinet minister and it is to be seen if the veteran will accept it.